It should be apparent that the voltage drop across each resistor is proportional to its resistance, given that the current is the same through all resistors. 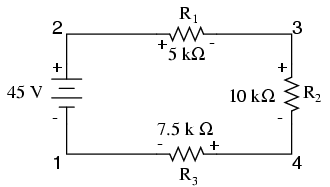 Notice how the voltage across R2 is double that of the voltage across R1, just as the resistance of R2 is double that of R1. 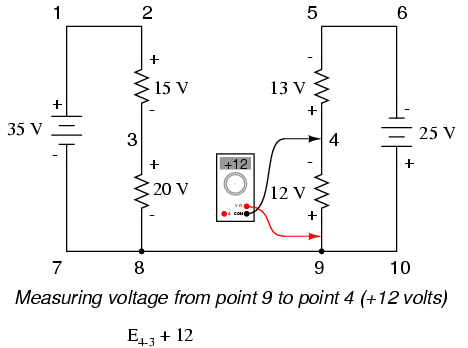 The voltage across R2 is still exactly twice that of R1's drop, despite the fact that the source voltage has changed. 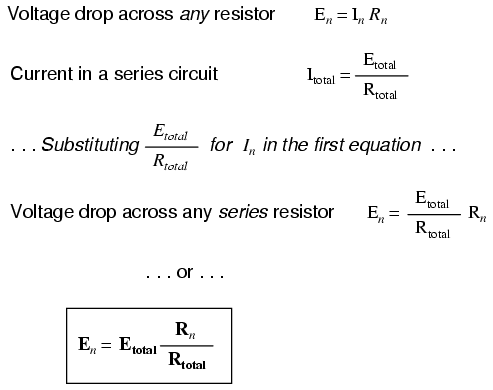 The proportionality of voltage drops (ratio of one to another) is strictly a function of resistance values. 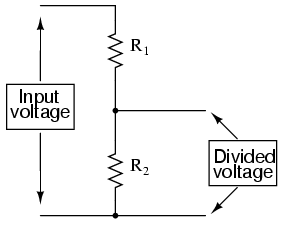 The ratio of individual resistance to total resistance is the same as the ratio of individual voltage drop to total supply voltage in a voltage divider circuit. 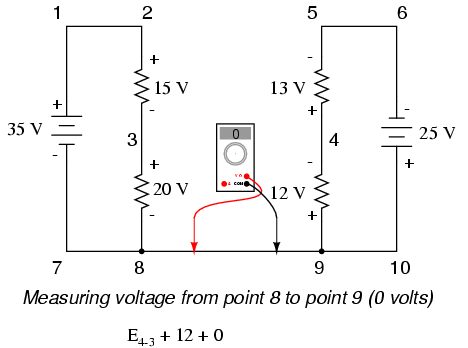 This is known as the voltage divider formula, and it is a short-cut method for determining voltage drop in a series circuit without going through the current calculation(s) of Ohm's Law. 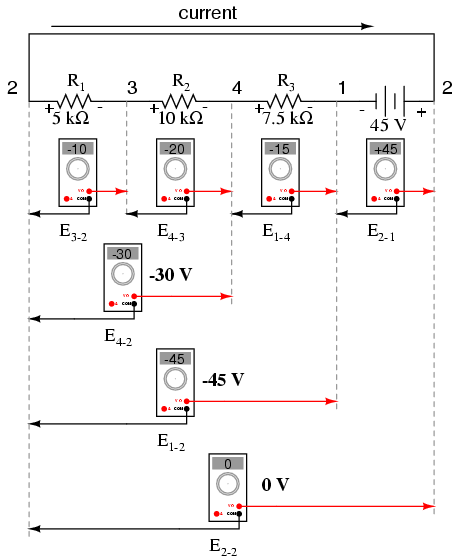 Voltage dividers find wide application in electric meter circuits, where specific combinations of series resistors are used to "divide" a voltage into precise proportions as part of a voltage measurement device. The wiper contact is the left-facing arrow symbol drawn in the middle of the vertical resistor element. As it is moved up, it contacts the resistive strip closer to terminal 1 and further away from terminal 2, lowering resistance to terminal 1 and raising resistance to terminal 2. As it is moved down, the opposite effect results. 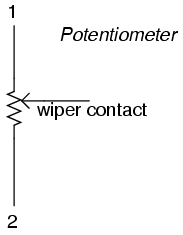 The resistance as measured between terminals 1 and 2 is constant for any wiper position. 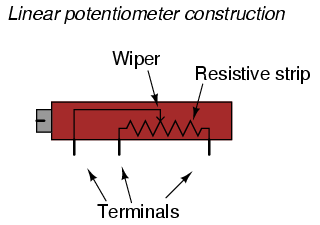 Some linear potentiometers are actuated by straight-line motion of a lever or slide button. Others, like the one depicted in the previous illustration, are actuated by a turn-screw for fine adjustment ability. The latter units are sometimes referred to as trimpots, because they work well for applications requiring a variable resistance to be "trimmed" to some precise value. It should be noted that not all linear potentiometers have the same terminal assignments as shown in this illustration. With some, the wiper terminal is in the middle, between the two end terminals. Just like the fixed voltage divider, the potentiometer's voltage division ratio is strictly a function of resistance and not of the magnitude of applied voltage. 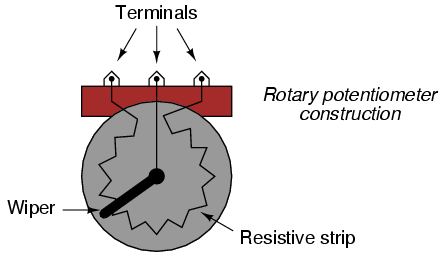 In other words, if the potentiometer knob or lever is moved to the 50 percent (exact center) position, the voltage dropped between wiper and either outside terminal would be exactly 1/2 of the applied voltage, no matter what that voltage happens to be, or what the end-to-end resistance of the potentiometer is. In other words, a potentiometer functions as a variable voltage divider where the voltage division ratio is set by wiper position. 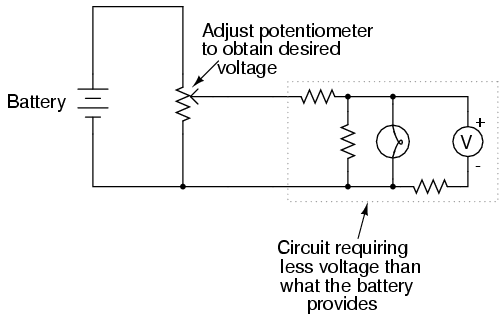 When used in this manner, the name potentiometer makes perfect sense: they meter (control) the potential (voltage) applied across them by creating a variable voltage-divider ratio. 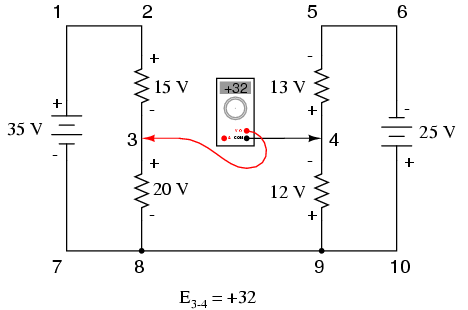 This use of the three-terminal potentiometer as a variable voltage divider is very popular in circuit design. The smaller units on the very left and very right are designed to plug into a solderless breadboard or be soldered into a printed circuit board. The middle units are designed to be mounted on a flat panel with wires soldered to each of the three terminals. 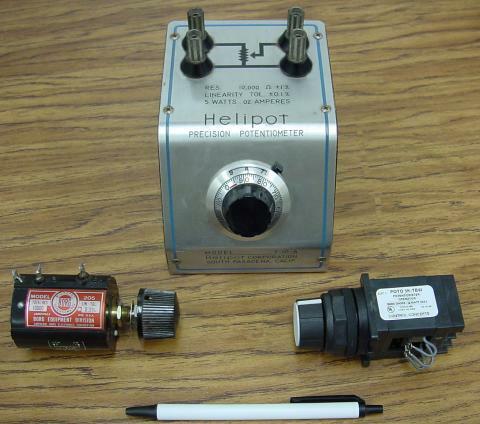 The large "Helipot" unit is a laboratory potentiometer designed for quick and easy connection to a circuit. 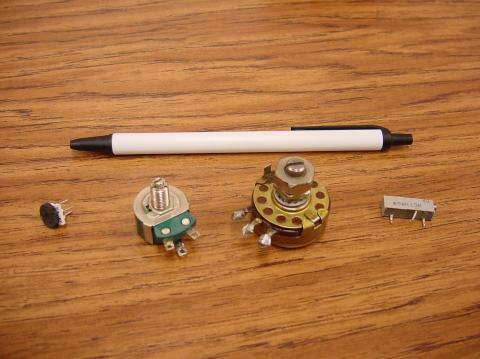 The unit in the lower-left corner of the photograph is the same type of potentiometer, just without a case or 10-turn counting dial. 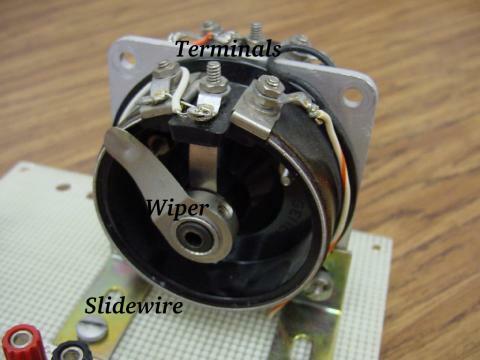 Both of these potentiometers are precision units, using multi-turn helical-track resistance strips and wiper mechanisms for making small adjustments. The unit on the lower-right is a panel-mount potentiometer, designed for rough service in industrial applications. 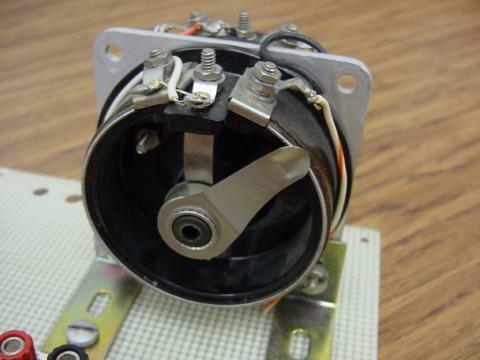 A potentiometer is a variable-resistance component with three connection points, frequently used as an adjustable voltage divider. 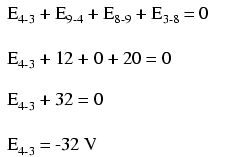 When a voltage is specified with a double subscript (the characters "2-1" in the notation "E2-1"), it means the voltage at the first point (2) as measured in reference to the second point (1). 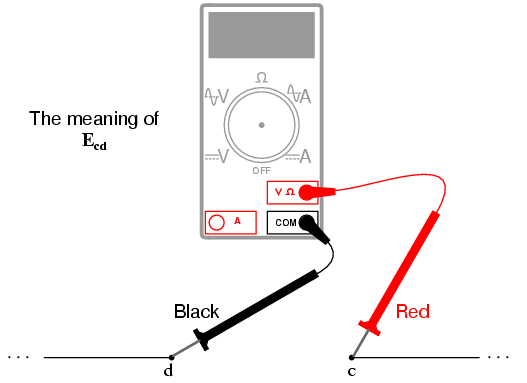 A voltage specified as "Ecg" would mean the voltage as indicated by a digital meter with the red test lead on point "c" and the black test lead on point "g": the voltage at "c" in reference to "g". "The algebraic sum of all voltages in a loop must equal zero"
It's still the same series circuit, just with the components arranged in a different form. Notice the polarities of the resistor voltage drops with respect to the battery: the battery's voltage is negative on the left and positive on the right, whereas all the resistor voltage drops are oriented the other way: positive on the left and negative on the right. This is because the resistors are resisting the flow of electrons being pushed by the battery. In other words, the "push" exerted by the resistors against the flow of electrons must be in a direction opposite the source of electromotive force. 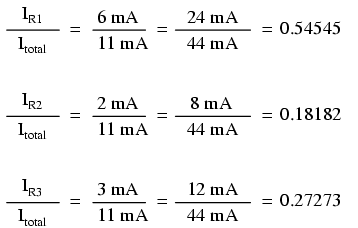 The fact that series voltages add up should be no mystery, but we notice that the polarity of these voltages makes a lot of difference in how the figures add. While reading voltage across R1, R1--R2, and R1--R2--R3 (I'm using a "double-dash" symbol "--" to represent the series connection between resistors R1, R2, and R3), we see how the voltages measure successively larger (albeit negative) magnitudes, because the polarities of the individual voltage drops are in the same orientation (positive left, negative right). The sum of the voltage drops across R1, R2, and R3 equals 45 volts, which is the same as the battery's output, except that the battery's polarity is opposite that of the resistor voltage drops (negative left, positive right), so we end up with 0 volts measured across the whole string of components. That we should end up with exactly 0 volts across the whole string should be no mystery, either. 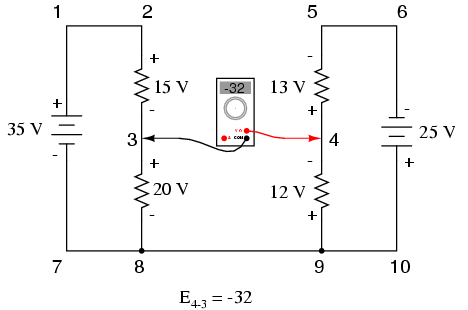 Looking at the circuit, we can see that the far left of the string (left side of R1: point number 2) is directly connected to the far right of the string (right side of battery: point number 2), as necessary to complete the circuit. 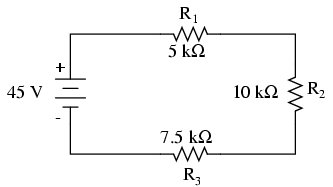 Since these two points are directly connected, they are electrically common to each other. And, as such, the voltage between those two electrically common points must be zero. 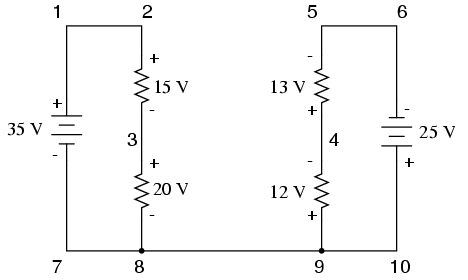 Note how I label the final (sum) voltage as E2-2. Since we began our loop-stepping sequence at point 2 and ended at point 2, the algebraic sum of those voltages will be the same as the voltage measured between the same point (E2-2), which of course must be zero. Try any order of steps from any terminal in the above diagram, stepping around back to the original terminal, and you'll find that the algebraic sum of the voltages always equals zero. Stepping around the loop 3-4-9-8-3, we write the voltage drop figures as a digital voltmeter would register them, measuring with the red test lead on the point ahead and black test lead on the point behind as we progress around the loop. Therefore, the voltage from point 9 to point 4 is a positive (+) 12 volts because the "red lead" is on point 9 and the "black lead" is on point 4. The voltage from point 3 to point 8 is a positive (+) 20 volts because the "red lead" is on point 3 and the "black lead" is on point 8. 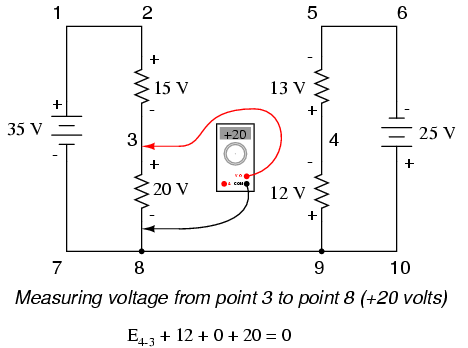 The voltage from point 8 to point 9 is zero, of course, because those two points are electrically common. It is important to realize that neither approach is "wrong." 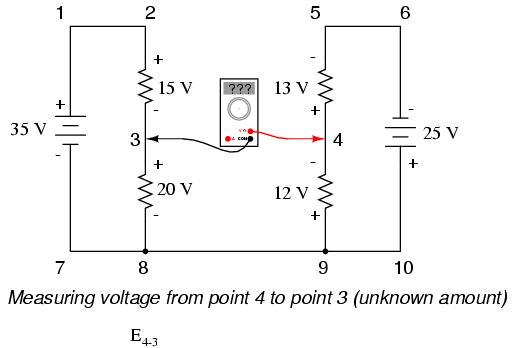 In both cases, we arrive at the correct assessment of voltage between the two points, 3 and 4: point 3 is positive with respect to point 4, and the voltage between them is 32 volts. 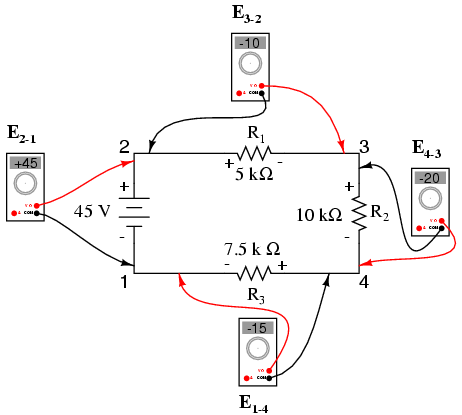 Kirchhoff's Voltage Law (KVL): "The algebraic sum of all voltages in a loop must equal zero"
Once again, it should be apparent that the current through each resistor is related to its resistance, given that the voltage across all resistors is the same. Rather than being directly proportional, the relationship here is one of inverse proportion. For example, the current through R1 is half as much as the current through R3, which has twice the resistance of R1. 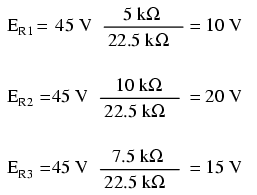 The current through R1 is still exactly twice that of R2, despite the fact that the source voltage has changed. The proportionality between different branch currents is strictly a function of resistance. 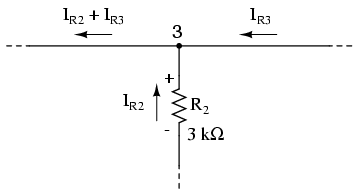 The ratio of total resistance to individual resistance is the same ratio as individual (branch) current to total current. 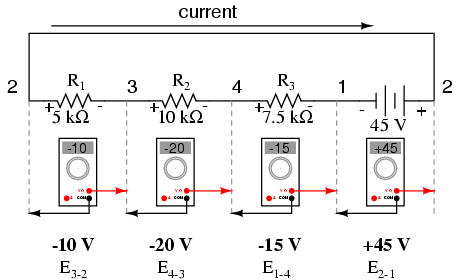 This is known as the current divider formula, and it is a short-cut method for determining branch currents in a parallel circuit when the total current is known. 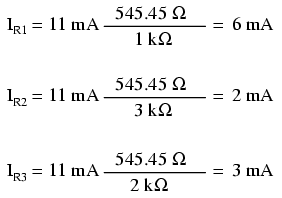 It is quite easy to confuse these two equations, getting the resistance ratios backwards. One way to help remember the proper form is to keep in mind that both ratios in the voltage and current divider equations must equal less than one. 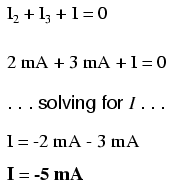 After all these are divider equations, not multiplier equations! If the fraction is upside-down, it will provide a ratio greater than one, which is incorrect. Knowing that total resistance in a series (voltage divider) circuit is always greater than any of the individual resistances, we know that the fraction for that formula must be Rn over RTotal. 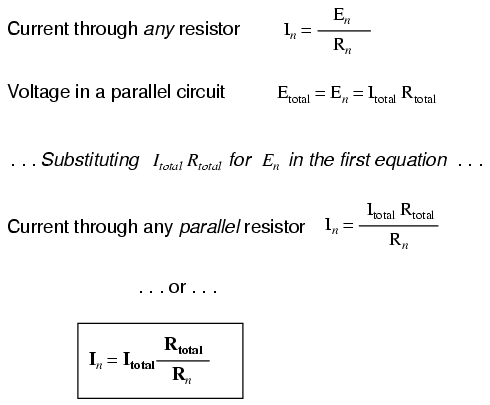 Conversely, knowing that total resistance in a parallel (current divider) circuit is always less then any of the individual resistances, we know that the fraction for that formula must be RTotal over Rn. At each node on the negative "rail" (wire 8-7-6-5) we have current splitting off the main flow to each successive branch resistor. At each node on the positive "rail" (wire 1-2-3-4) we have current merging together to form the main flow from each successive branch resistor. This fact should be fairly obvious if you think of the water pipe circuit analogy with every branch node acting as a "tee" fitting, the water flow splitting or merging with the main piping as it travels from the output of the water pump toward the return reservoir or sump. "The algebraic sum of all currents entering and exiting a node must equal zero"
The negative (-) sign on the value of 5 milliamps tells us that the current is exiting the node, as opposed to the 2 milliamp and 3 milliamp currents, which must were both positive (and therefore entering the node). Whether negative or positive denotes current entering or exiting is entirely arbitrary, so long as they are opposite signs for opposite directions and we stay consistent in our notation, KCL will work. 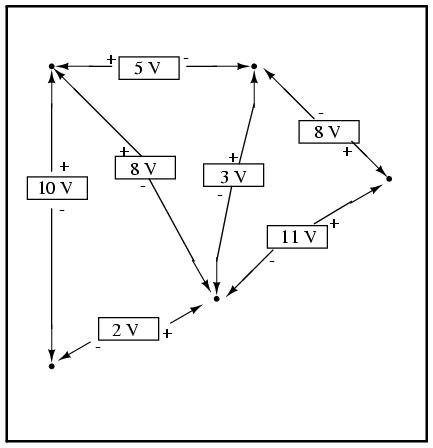 Together, Kirchhoff's Voltage and Current Laws are a formidable pair of tools useful in analyzing electric circuits. Their usefulness will become all the more apparent in a later chapter ("Network Analysis"), but suffice it to say that these Laws deserve to be memorized by the electronics student every bit as much as Ohm's Law. Kirchhoff's Current Law (KCL): "The algebraic sum of all currents entering and exiting a node must equal zero"